When off campus, you'll be prompted to sign in with your UA NetID and password to access library content. Or you can download Virtual Private Network (VPN), free for students and instructors. The VPN provides a secure connection with the UA network. It requires UA NetID+ Two-Factor Authentication, providing another layer of security. Can't connect? See connecting to library resources for common problems and solutions, or contact us. We have lots of print content, online resources, streaming video, and primary sources that we encourage instructors to use in their courses. By using library-provided or open content, you'll save students the cost of expensive textbooks. To learn more about open educational resources (customizable and free to download, print, copy, and share), contact open education librarian Cheryl Cuillier. From your search results, filter to Available in the Library for print books or Full Text Online for ebooks. Some ebooks limit the number of people who can view them at once. If the ebook record doesn't say that access is unlimited or simultaneous users are allowed, contact your librarian before using it in your class. Learn more about finding and using ebooks. To find open ebooks without publisher restrictions, add the Open Access filter in your library search results for ebooks. Or search OER repositories directly (the Open Textbook Library is a great place to start). We also recommend finding a relevant subject guide and using recommended databases in your field. Use our guide to finding films, which lists a variety of streaming options. Look for a result with Audio Visual as the material type. DVDs are listed separately from streaming video. For streaming video, look for the green Available online > link. Not all Kanopy films have been added to library search, so you’ll need to search the Kanopy Streaming Video database directly. Each term you plan to use videos in a course, submit those requests by the deadline as part of the UA BookStores’ textbook adoption process. Streaming video often can't be purchased outright and must be licensed annually by the library, so we need to know if it will continue to be used in courses before extending the license. To learn more, read about video streaming. Ask us for help or contact your librarian. You can also request materials. You can usually digitize in-copyright articles and book chapters for your class without permission, as long as they're required readings made available only to students in your class (such as through D2L Brightspace or a password-protected website). Fair use guidelines advise limiting the amount to one article per journal issue or one chapter per book (or up to 10%, if articles/chapters are short). Using these guidelines, we can scan and send you digitized articles or chapters through document delivery. Larger portions of some works may still be fair use, depending on the context. For more information on copyright or making a fair use evaluation, see our guidelines for instructors or contact copyright librarian Ellen Dubinsky. Links can break, so you need a permalink to the resource to place in D2L Brightspace or wherever your course content resides. This is a persistent link that won't break from off campus. D2L Help Pages for instructors provide detailed instructions on adding content, adding multimedia, and modifying content (select the > to expand each topic). Look for a link titled "Permalink," "Copy link," or "Copy direct link"
Selecting that link will usually copy the URL to your clipboard. Otherwise, you can highlight and copy the URL. Paste the URL into our ezproxy tool. This will add an ezproxy prefix to the URL, making access from off campus much easier. It's best to link directly to content rather than uploading PDFs. An exception is with document delivery (digitized chapters and articles we email to you). Those links expires after 30 days, so it's best to upload the PDF to D2L Brightspace. Permalinks are often really long. Use TinyURL if you need to display a permalink in your syllabus or elsewhere. It will convert a long URL to a much shorter one. 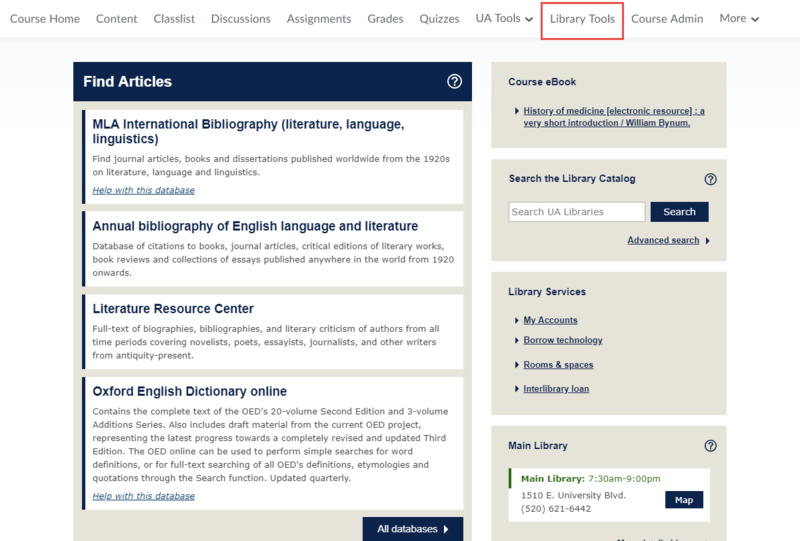 A "Library Tools" link appears in the top toolbar of D2L Brightspace course sites by default, unless a college or instructor has removed it. It contains subject-specific library resources and ebook versions of required textbooks. Work with your librarian to customize the content (Library Tools in Law and Health Sciences course sites aren't fully customizable yet).